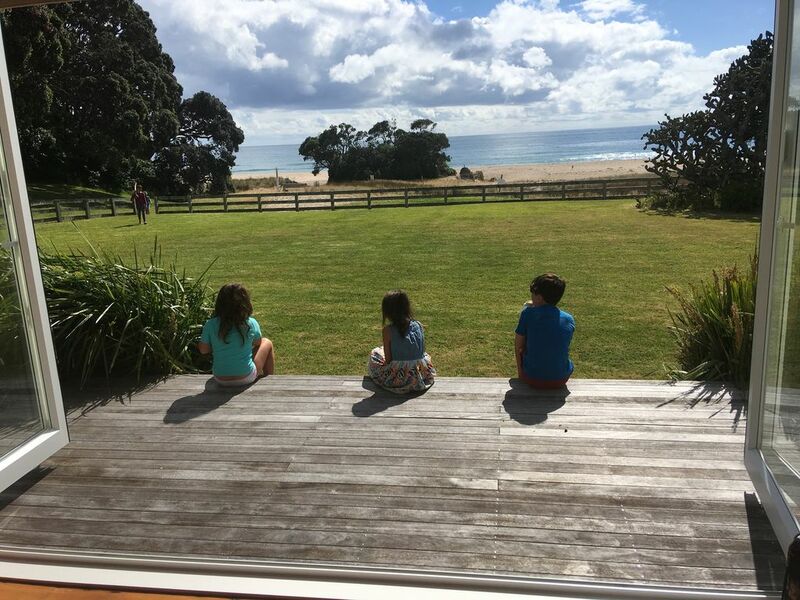 A Unique Family Home placed, on what we believe is, the most beautiful beach in New Zealand! Onemana Pararaiha was the First Original Farm House of Onemana and therefore holds the most prestigious position on the beach. It is extremely spacious, set on 3/4 acre of prime beachfront and could easily accommodate 3 families. The house has 7 bedrooms, 1 family bathroom, 1 ensuite to the master bedroom. And an outside bathroom which is perfect to wash the sand away after a day at the beach! Nearly every bedroom has breathtaking sea views, the bunk room and double bedroom have a lovely outlook to the leafy back yard. 3 x Queen rooms over look the beach and have direct access to the deck area. There is 1 room with a king single and trundle bed. The house has 3 family rooms in total including 1 x lounge room with Smart Television and freeview, 1 x sitting room with balcony that is off the main master bedroom and lastly the main family room which has large bi-fold doors that lead to a small deck over looking the expansive front yard and stunning Onemana beach. You can also access the main front deck from here too. There are many places in the house to be together or be apart. The choice is yours. Please note that there is a Double garage\ Sleepout that will be locked and will not be accessible to our guests as it holds personal property. There is off street parking for at least 7 cars at the back of the house. We have a Local House Manager to help guests with any problems you may have while staying at Onemana Pararaiha. I will also be contactable at any time if needed and will be there to help through out the booking process- This is our special family home and we are happy to share such an amazing piece of paradise with you. Onemana Pararaiha is the perfect house for Corporate team building events, corporate planning weekends, photo shoots and film locations. It would also be the most spectacular setting for a special yoga or health retreat and mini break. Small boutique weddings will be considered- Please contact me. I grew up on the Coromandel Peninsula and love returning every year to what I believe is Pure Paradise. I currently live in the UK near London with my husband and 4 beautiful children. I believe you would find it hard to discover another home like Onemana Pararaiha. The beachfront position and the space of the property makes it hard to beat. I do not know another house in the area like it. The space of the property and the size of the plot on the beachfront makes this house special and unique. Surrounded by beautiful native forest and stunning pohutakawa trees ( New Zealand Christmas tree). You can walk through the forest tracks with view of the ocean to empty beaches and bays.We have a large family and lots of friends and this is the perfect home for entertaining and spending time with loved ones. The beach bathroom is situated just outside the kitchen and you access from the side porch. It has a toilet and shower. Perfect when returning sandy from beach. Onemana is surrounded by farm land, native forest and forestry forest . Restaurant, take away and small convenience store. Whangamata is a thriving beach town with all amenities and is only 6 km away. Wharekawa river runs nearby. Wentworth valley just past Whangamata has amazing river swimming holes to swim in. Most prestigious position on the beach.Onemana Pararaiha is set on 3/4 acre of prime beachfront . Beautiful Ocean views from all front decks, bacons and nearly every room in the house. Huge front lawn and lovely back lawn with trees. 400 metres away on the beachfront in Onemana. What a beautiful place for a family holiday. Amazing!! We had such an incredible time her with our whole family. Couldn’t ask for closer to the beach and the house was perfect for us, kids and parents alike. Super friendly contact and the place was so clean and well presented. We will 100% be back again. Thank you for coming Craig! We are so happy you enjoyed our beachfront paradise and we would love to have you back! Local services, businesses and all sports and adventure activities can be found in Whangamata town 6km away. Coromandel Peninsula has many amazing surf towns that offer many activities.